This yummy pickle from North Indian cuisine brings water in the mouth. 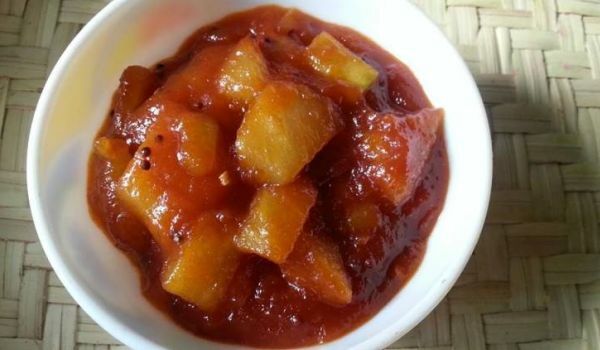 Learn how to make/prepare Sweet and Sour Mango Pickle by following this easy recipe. Take raw mangoes, peeled and cut into thin slices. Heat the pan and mix sugar and water in it, enough to dissolve the sugar. Cook and stir, till the sugar dissolves. Add the sliced mangoes, bay leaves, peppercorns, red chillies, cloves and garlic and cook it for about 30 to 35 minutes. Remove from the heat when the mango pieces become soft and tender and the sugar syrup is of one string consistency. Now add chili powder, fennel seeds, salt, cashew nuts and cumin seeds in it and mix well. Let it cool cool. Preserve it in sterilized glass jar and refrigerate it, where it will keep fresh for one year.